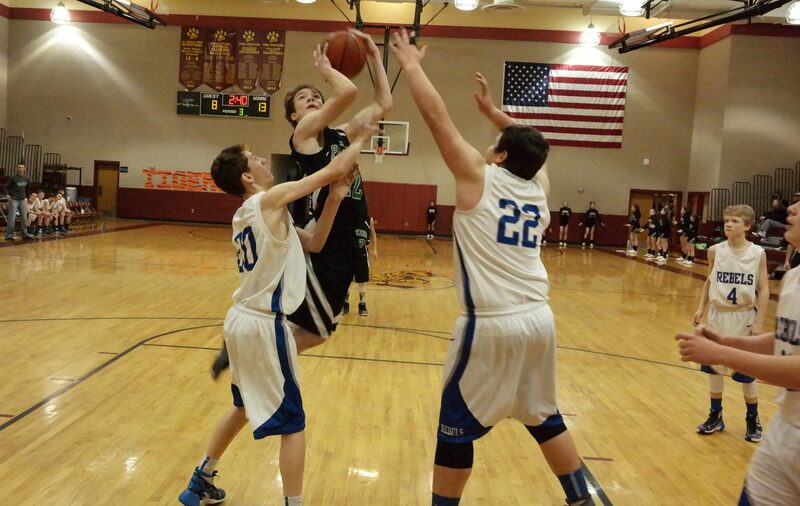 The 2015-16 eighth-grade boys North Georgia Mountain League championship game is now set, as the Clear Creek Middle School Bobcats will take on the Pickens County Middle School Dragons. 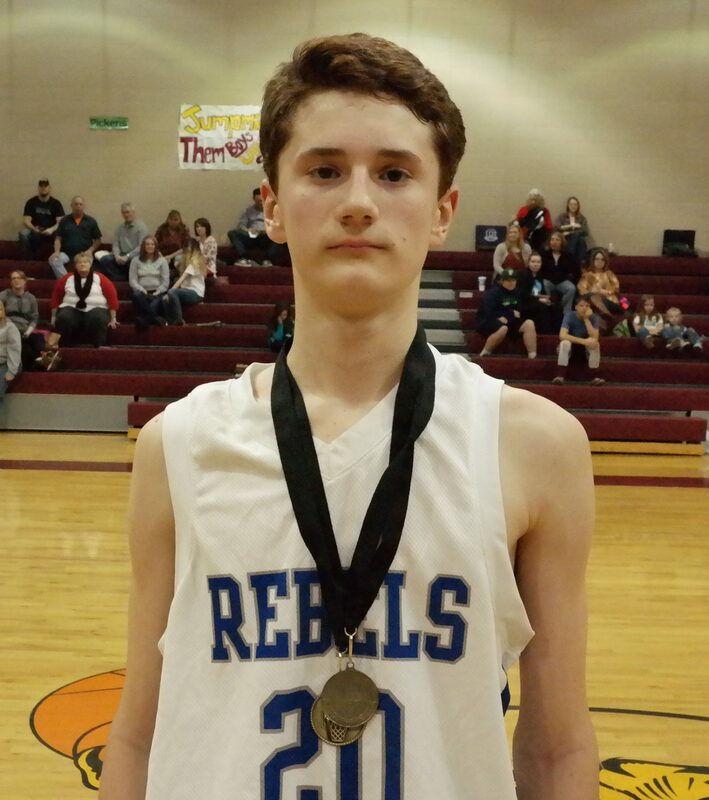 The contest was solidified yesterday, after Pickens defeated the Fannin County Middle School Rebels 27-15 and CCMS bested the Riverview Eagles 27-20 in semifinal action at Dawson County Middle School. Both the Dragons and the Rebels struggled offensively out of the gate, due to a combined 13 rebounds between both teams in the first quarter. A T.C. Jarrett bucket was all the scoring produced in the first quarter, giving Pickens a 2-0 lead. Second-quarter foul shots from Brady Moore and Austin Chester extended the Dragons lead to 5-0. Fannin surged back after a Matthew Shirah three-point shot with 52 seconds remaining in the half. Two free throws from Miles Johnson sent the game into halftime tied, 5-5. The lead traded sides several times throughout the third quarter, with the Rebels coming out ahead 13-12 by the end of the period. However, the Dragons made a comeback in the fourth quarter with a 15-2 run. A putback from Gabe Buchanan was the last offense generated by Fannin, before Pickens built a insurmountable fire to extinguish. Jarrett, Moore, Boz Gayden and Hayes Pickett all contributed baskets and foul shots that went on to give the Dragons the semifinal victory. Riverview held Clear Creek scoreless throughout the first quarter and opened up a 7-0 lead in the process. C.J. Streicher sank an early second-quarter foul shot to finally get the Bobcats on the scoreboard, but despite later buckets from Alex Snelgrove, the Eagles soared to an 11-6 halftime advantage. 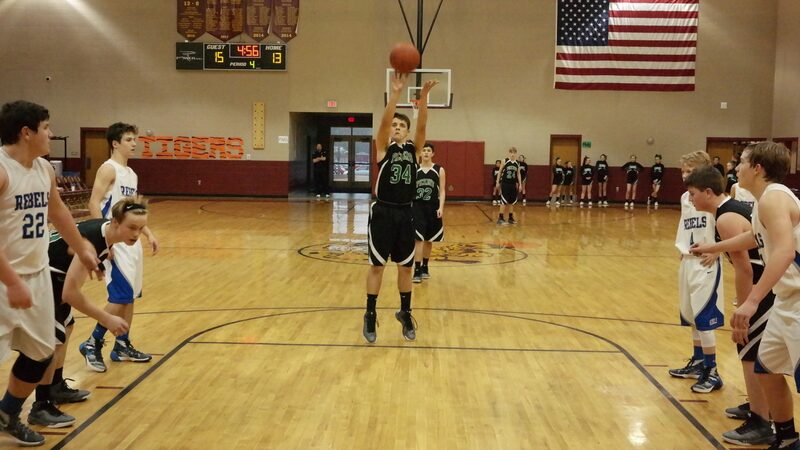 CCMS turned things in its favor in the third quarter. Three three-point shots from Connor Thompson breathed life into the Bobcats offense, with the third one tying the game 15-15 at the two-minute mark. Luke Wimpey then pulled Clear Creek ahead 19-18 with seven seconds remaining in the period, providing the Cats with a wave of momentum to ride into the fourth quarter. The Eagles had a basket from in the final six minutes, while Clear Creek had another three from Thompson and one from Snelgrove. The shots helped propel the Bobcats to the 27-20 triumph. 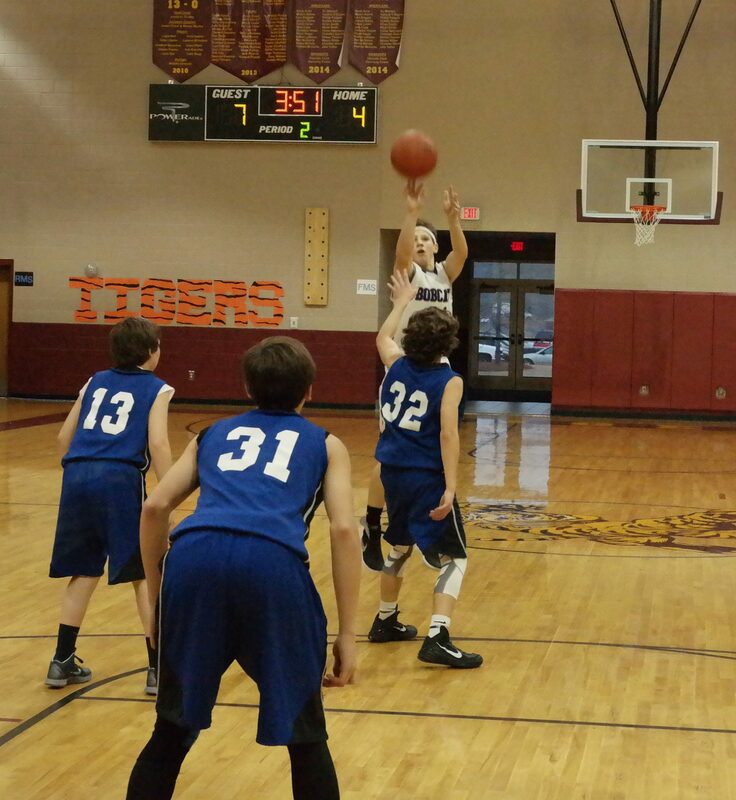 Clear Creek and Pickens will meet to determine the 2015-16 NGML eighth-grade boys champion tomorrow at 5:15 p.m. at Dawson County Middle School. 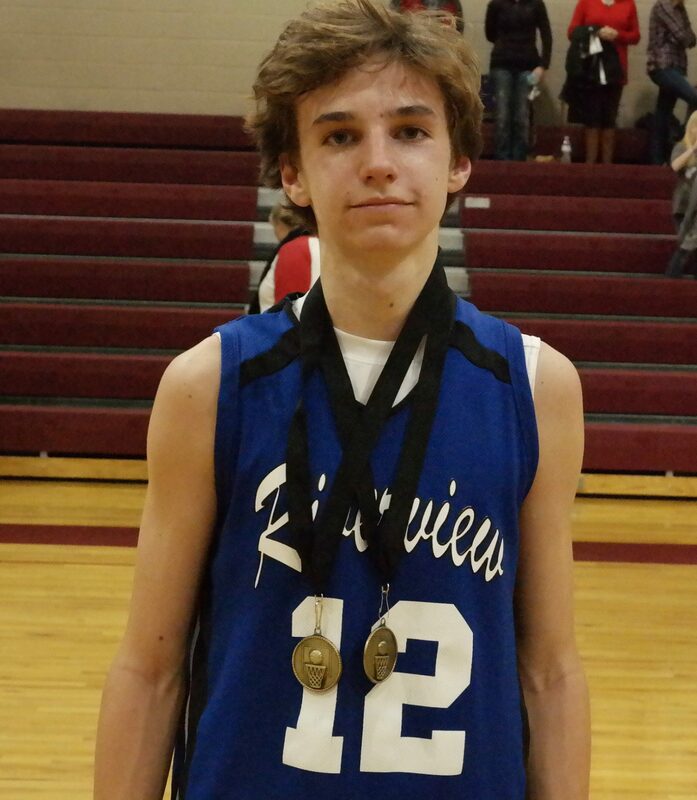 After the Clear Creek/Riverview contest, the eighth-grade Riverview Eagles recognized Campbell Reed as both their Academic and All-Tournament selection. (Photo by: Kevin Hensley). T.C. Jarrett: Eight points, eight rebounds, six steals, 2/4 on free throws. Brady Moore: Eight points, 11 rebounds, one steal, 6/9 on free throws. Hayes Pickett: Seven points, five rebounds, one block, 1/7 on free throws. Boz Gayden: Three points, two rebounds, two steals, 3/8 on free throws. Austin Chester: One point, one rebound, one block. Carter Logan: Five rebounds, one steal. Zach Tetterton: Two rebounds, one steal. Matthew Shirah: Nine points, three rebounds. Cohutta Hyde: Two points, three steals, two rebounds. Miles Johnson: Two points, four rebounds, one steal, one block, 2/4 on free throws. Gabe Buchanan: Two points, two rebounds. Carsen Beavers: Six steals, three rebounds. Connor Thompson: 14 points, six rebounds, three steals, two blocks. Alex Snelgrove: Eight points, seven rebounds, one steal, 1/4 on free throws. C.J. Streicher: Two points, nine rebounds, two steals, 2/4 on free throws. Campbell Reed: Eight points, three steals, one rebound. Payton Goodwin: Three points, six rebounds, 0/2 on free throws. Ty Kyle: Three points, five rebounds, one steal. Will Glaze: Two points, nine rebounds. Devin Joy: Two points, one rebound, one steal, 2/2 on free throws. Brady Howell: Two points, two rebounds, one block.